For most people, choosing an engagement ring is no straight-forward task. No only is it a piece of jewellery you're likely to spend a small fortune on, it's also something that will hopefully be around for a lifetime, on show to others and in the eyeline of the wearer day after day, year after year. Needless to say, a good bit of thought needs to go into it. And while you may think that 'engagement rings' follow a specific structure - gold or platinum with a pretty diamond or two on top, there are of course a myriad styles to contend with. For some people, the traditional simply doesn't suit, and the idea of a bespoke, custom made ring is a better fit. Here are some of the perhaps lesser known Irish jewellers to check out. Based in Skibbereen in her native West Cork, goldsmith and jewellery designer Aoife O'Mahony has been creating elegant, timeless pieces since 2005. Simplicity and honesty are the cornerstones of Aoife's jewellery business, where raw materials of gemstones, diamonds and metals tell their own story, according the designer herself. Aoife has a small range of engagement rings available in her collection, including traditionally-inspired designs made from sapphires, pearls and rose gold. She is passionate about creating unique wedding and engagement rings, and remodelling old jewellery to give it a new lease of life. Stonechat Jewellers, located in the Westbury Mall in Dublin 2, is comprised of a team of four talented goldsmiths who specialise in both creative, contemporary commissions and remodelling old pieces into modern heirlooms. Established by Ann Chapman in 2012, the boutique and in-house workshop also stocks a range of specially selected Irish and European designers. 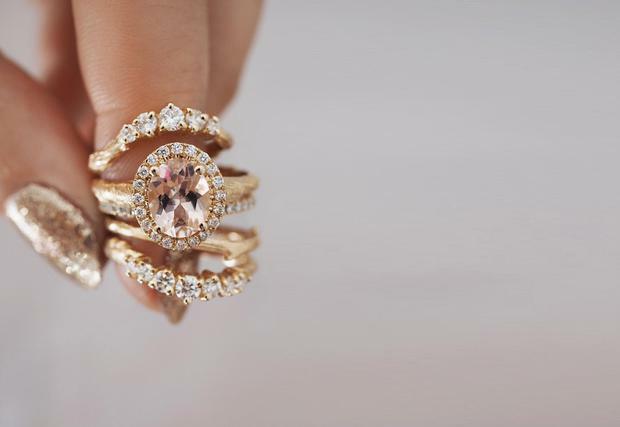 Purveyor of all things sparkly, Chupi Sweetman, the creator behind award-winning Irish jewellers Chupi has recently entered the world of weddings with her range of unique engagement rings and pavé wedding bands ideal for boho brides-to-be with a penchant for stacking. Engagement rings include gemstones such as grey diamonds, morganite, aquamarine and classic diamonds, and all Chupi's jewellery is handmade in Ireland with ethical gold and conflict free diamonds. A little bit of Friday sparkle 🥂✨⚡️ . I adore a curated stack of rings, each one marking a precious moment (my own stack is getting pretty outrageous 🙊 I’ve put pics on insta stories if you want to have a look!) but I know some people love a much simpler look with just engagement ring and a wedding band. . What do you think? Less is more or sparkle is magic? Fashion editor-turned-jeweller, Natasha Sherling is a GIA-trained gemmologist with an eye for quality gemstones. Pieces from Natasha's ready-to-wear collection are available to buy online, while her commission work is showcased through her beautifully curated Instagram account. Kilkenny-based Rudolf Heltzel has been at the forefront of original Irish jewellery design for over fifty years. Now in the hands of German-born Rudolf's son Christopher, its innovative jewellers and goldsmiths specialise in creating pieces of 'wearable art'. Christopher and his apprentices work using centuries-old tools to hand-craft sheet metal and precious gemstones into unique pieces including statement engagement rings that truly stand out from the norm. Donegal jeweller Eily O'Connell takes inspiration from nature - specifically man's destruction of it - for her collection of distinctive jewellery, the raw materials for which are sustainable and conflict-free. That background brings about somewhat of a macabre, other-worldly feel to her designs, which include original and curios rings representing tree barks, berries, algae, 'the forest floor' and the Fiji Mermaid, amongst others. Eily designs are for the truly unique, who search for beauty in nature. She does commission work from her workshop in Bath, UK. Goldsmith and contemporary jewellery designer Eva Dorney trained with the Craft Council of Ireland in Kilkenny before working in the jewellery industry, and eventually set up her own business in Dublin in 2011. Eva specialises in custom engagement rings and handmade wedding bands, which are noted for their clean, architectural lines. Although she says she can turn her hand to almost any style, she does favour a strong, contemporary feel for her designs, which can be created both from old pieces, and from new metals and gemstones. The Dublin-based jeweller documents some of her commissions on her blog - including a 'hidden inner wedding ring' which was made from a family heirloom yellow gold band covered with a more wearable platinum for one savvy bride - which make for fascinating reading for those looking to create something really special. Martina Hamilton is a Sligo-based goldsmith and jewellery designer specialising in commissions. Her location on the shores of the wild Atlantic lends itself to rugged, natural jewellery - a fusion of traditional craftsmanship and modern design. Martina's designs have been worn by royalty, and some of her collection is housed in her award-winning shop The Cat and the Moon, where she also stocks several hand-picked Irish jewellery designers and craftspeople. Together with her small family team of master goldsmiths, Martina creates beautiful commissions including elegant contemporary Irish heirlooms for the generations. Sligo based Tiffany Budd creates one-off designs in silver and gold, including special engagement ring commissions. Tiffany runs a 'make your own wedding rings' day course from her studio in Sligo where couples learn the skills of jewellery making and come out with their wedding bands on a one-to-one basis. Based in Dublin's Powerscourt Centre Abana is a bespoke jewellery design house specialising in unique engagement and wedding rings. This lovely couple came into us the day after their engagement with probably no real intention of finding a ring given their fragile post celebration state. Nevertheless they politely nodded along with us and eventually were so blown away with being able to design their own ring their headaches were cured! A year later we were delighted to be asked make their wedding rings. A matching diamond leaf effect band to tie in with the Engagement ring, and a Simple high polish gents band with a curve engraved around the centre to dress up a more traditional design. Thank you so much for the photo! Congratulations to this fab couple, it was great working with you both, you were always good craic when you came in to us. hope the day was amazing and the hangover wasn't too bad. *Disclaimer. Story may have been embellished we cannot cure hangovers. They have 40 years experience manufacturing jewellery and can even take on old jewellery and create something new if you have a piece you'd love to redesign and make your own.